Fox Agency is an integrated b2b marketing agency and long-time friend of B2B International. Our strategic partnership spans 8 years and has seen us work together on many projects for our clients. The partnership doesn’t stop there either. Nick Hague has delivered research training to the team at Fox Agency, and their global expansion follows a very similar path to ours – first London and then Dusseldorf. We invited Fox down to our weekly ‘Show and Tell’ meeting with the wider B2B International team to discuss our partnership, how it might develop in the future and how we can continue working together to benefit our clients. Check out the key discussion points from the meeting below. Brother Europe, Berlitz and Speedy Hire are just a handful of the clients who have benefited from our partnership with Fox Agency. The Brother Europe project, for example, saw B2B International reach out to Fox Agency to help bring to life outputs from a customer segmentation study. This involved identifying and exploring b2b audiences across many different industries and geographies. The resulting outputs are still used to this day to help drive key decision-making across Brother. You can read more about this case study here. The Berlitz project followed a similar story. 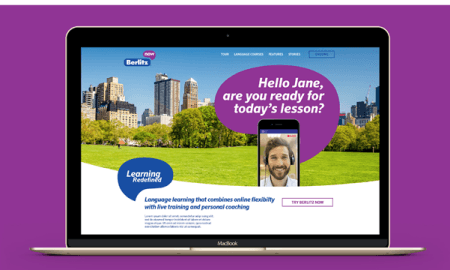 B2B International brought Fox Agency on-board to develop creative stimulus to help test concepts for a new online learning platform. 5 years later and these ideas have been transformed into a new virtual learning centre. These two cases are prime examples of how to deliver actionable insights. Bringing the research to life helps client teams to understand and embrace the findings, as well as implement the recommended changes with the full support of the organisation. 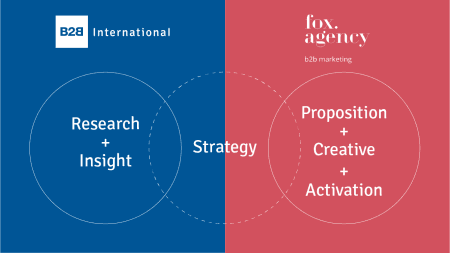 This is where the partnership between B2B International and Fox Agency comes in. As well as being expert researchers, we need to be expert storytellers. We know that to deliver insights with impact, we need to transform the facts, figures and charts synonymous with research into memorable, engaging and coherent stories. We need to ensure the insights deliver real value to decision-makers who rely on them. We need to bring the insights to life. This led to a discussion around the huge potential of a joint proposition between B2B International and Fox Agency. This unique offering would offer exciting opportunities for clients by combining our masses of shared experience and expertise in research, insight, strategy, proposition, creative and activation. Stay tuned for more on this exciting potential offering. It may just be the truly integrated proposition b2b markets have been waiting for! A final thanks to Fox Agency for coming down to Manchester to speak to the B2B International team.